Frequency Ranges: From 100 MHz to 24 GHz, any optimized bandwidth is available. TTL Compatible Logic: Logic ‘1’ = Isolation and Logic ‘0’ = Insertion Loss. For switches without a TTL driver, +1 VDC @ +50 mA = Isolation and -1 VDC @ -50 mA = Insertion Loss. For additional logic options, please consult the factory. 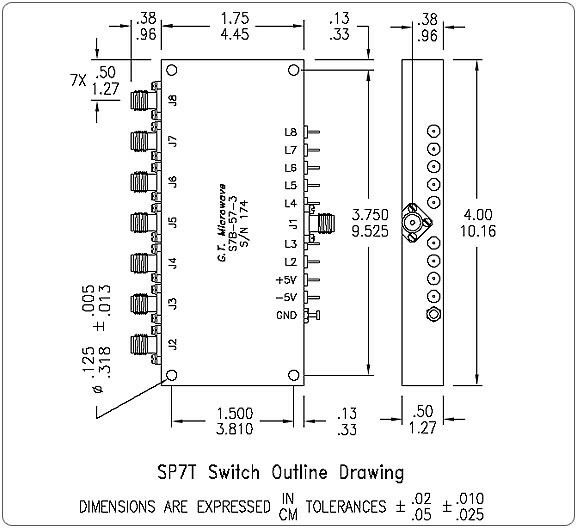 High Speed Switching: Switches are measured from 50% TTL to 10% / 90% RF from any set value to any set value. Operating Temperature Range: Standard models include temperature compensation in a range from -55° to +85° C. For more severe environments, please consult the factory. Low DC Power Consumption: Switches with TTL drivers require ±5 VDC @ +300/-80 mA. High RF Power Handling: For power levels greater than listed, please consult the factory. Absorptive Switches: The J2-J8 ports are non-reflective. Standard Interfaces: RF port connectors are ‘SMA’ female per MIL-C-39012. DC/Logic connections are solder terminals. Please consult the factory for additional options. Matched Phase & Amplitude: Models listed are available with matched ports. Otherwise, add 0.25 dB loss to ports J2 & J8. Please consult the factory. For substantial improvement in performance, ask for optimized narrowband models.